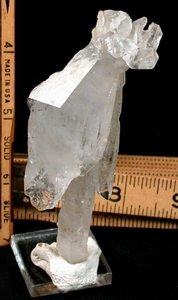 Scepter crystals form in many locations and as a category, are not uncommon. Of course, here's an Arkansas exception! 3/8"x 1-1/4"x 4" tall [including the partially penetrated 'topknot' cluster of penetrated and doubly-terminated crystals, 3/4"x 1"], you have a slightly curved, elestiallated back tabular crystal impaled on an ALSO slightly curved real rare elestiallated DOGTOOTH crystal, with a curved ALSO ellestiallated [wrinkled] AND dogtooth crystal meandering along the other two. Fully fashioned, trivial edge wear to a portion of the top little cluster noted, as are the stripey veils and a tiny rainbow or two. You'll rule.